out of sight, out of mind…. My colleague shared a very powerful data viz project with me today by Pitch Interactive called ‘Out of Sight, Out of Mind’. 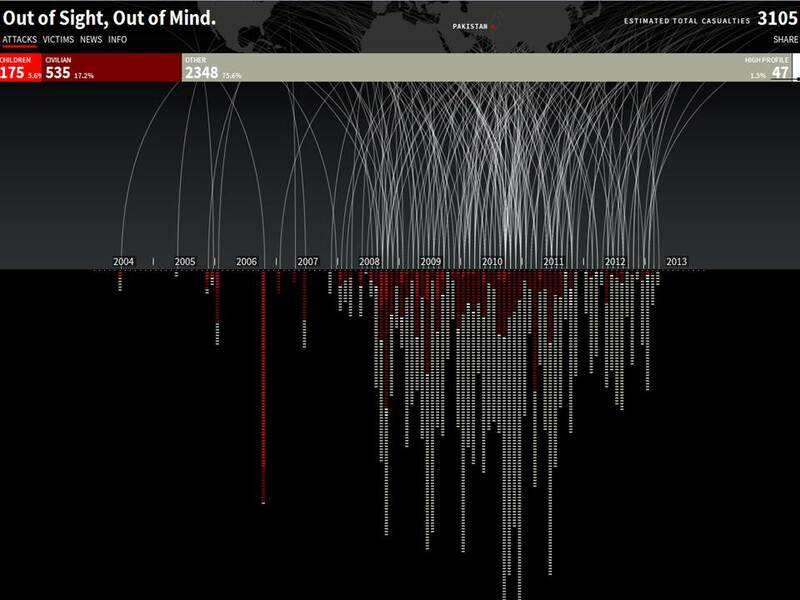 This animated and interactive visualization brings to light the the number of casualties from drone air strikes in Pakistan since 2004. Each click is like turning a new page in a very sad but true story. What has been ‘out of sight’ to-date is now clearly displayed for all to see. A truly shocking image and a sad reality of war. Projects like this are examples of how data visualization can be leverage to shed light on information disguised by the media or government, and (ideally) drive change.